To most researchers, “branding” is a seemingly crass marketing process used to sell products from candy bars to computers. Scientists may also be vaguely aware that their institutions spend considerable time and effort developing and protecting their brands. But whether scientists know it or not, they are “branded” as well, and since branding is fundamentally a communication strategy, it’s quite central to the topic of this blog. In this post, I asked branding expert Dr. Arlene Barro, a behavioral educational psychologist, to explain branding as it relates to scientists and their careers. Her answers also offer insight for journalists and public information officers. (Of course branding is just one aspect of career management. Scientists need to develop an array of communication and other skills to succeed, and the best source of information is Science magazine’s Science Careers web site) . “Can you imagine a world without brands?” asks Barro, declaring that unless professionals strategically think about their brands, they are presenting themselves as anonymous without even knowing it. Barro’s insights are particularly cogent because she has an academic as well as business background. She holds a PhD in education with distinction from UCLA for her doctoral dissertation on creativity. She has served as a visiting professor in the medical education department at Ben Gurion University in Israel; a dean at the medical school of the State University of New York at Stony Brook; and as a professor at Thomas Jefferson University’s medical school in Philadelphia. At the National Cancer Institute, she administered a $60 million public and professional education program, founded and directed the NCI’s first educational research and evaluation branch, and envisioned and directed a first-of-its-kind national program to educate physicians and other health professionals about disease prevention, with a focus on cancer. As creator of the Right Fit Method for career success and management, she is now a branding and hiring expert—heading Barro Global Search, Inc.—who works with high-level executives and employers. 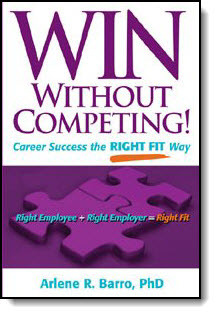 The Right Fit Method is the focus of her book WIN Without Competing!, nominated for a business book award, which mentors job seekers on how to present themselves as the One Right Fit to employers. To motivate job seekers to recognize the importance of their brand and whether it’s effective in their job search, she developed the app iBrandU4Hire: Rate Your Brand Zero to Hire. How do you define branding in the context of your work with business professionals, and how might that definition apply to scientists? Before defining “branding’” I think that it is important to recognize that the job search arena has changed dramatically over the last five years. The economic downturn, coupled with the strong focus on social networking and online resume or curriculum vitae submissions has created a significant need for branding. In order for employers to find you, your online submissions must have a distinct, intriguing, and recognizable brand. Employers must grasp your brand in a flash. You must differentiate yourself from others who do what you do. Whether you’re a business professional or a scientist, you face the same challenge. How can you meet that challenge? Recognize that you have a brand, even if articulating that brand is not easy for you to do. Broadcast your brand to succeed in your job search. Pitch your brand by phone before submitting your resume or curriculum vitae online. Avoid blasting your resume from Burbank to Bombay. Overcome and eliminate objections and distractions to your candidacy, which appear on your resume and curriculum vitae. Your brand has two sides like a coin: the written script (resume or curriculum vitae) and the verbal broadcast (interview). And you must know how to brand both sides. Do not assume that the usual professionally prepared resumes or curricula vitae will include your brand. Resumes and curricula vitae are no longer just factual representations of your career history. They must be carefully crafted to communicate your brand to convince the employer to hire you. As for the interview, you must carefully orchestrate the encounter to demonstrate that you are the right fit for the job. The goal is to stop the employer from interviewing other candidates after they have interviewed you. Is branding just a process undertaken during a job search, or does it have broader applications? Branding must be used for all aspects of your career advancement. Once you capture the right job, you must reinforce your brand to advance. Depending on what that specific career goal is will determine the communication strategies that you must implement. Of primary importance is engaging the right people in conversation. This may sound obvious, simple and easy. It’s not. The art of conversation has declined. Why should you chat when you can email or text? In fact, many job seekers perform poorly at interviews because they cannot carry on a conversation to convince employers to hire them. Why is branding necessary for all professionals including scientists to advance their careers? You cannot assume that “the world” comprehends the significance of your accomplishments, appreciates your uniqueness, and values your positive impact on others. It is your responsibility to broadcast your brand. I know that many scientists recoil at the thought of branding. They want and assume that their research will speak for them, and of course bragging and boasting are unacceptable. As often as seems appropriate, perhaps semi-annually or quarterly, write a report summarizing your efforts and achievements. The frequency depends on the nature of what you do. Remember you will need to shed the cloak of modesty while you are writing these reports. Be sure that your reports fit your readers, which should include your supervisor and others who evaluate your performance. To do that, you need to understand what they expect from you and what concerns they may have about you. I recommend that you present each report in person, if that is feasible. This approach gives you the opportunity to discuss your efforts and achievements, as well as to obtain feedback. You will be amazed what you can learn while broadcasting your brand. You might even be asked to assume a new responsibility! As head of the NCI’s education program, my colleagues and I had sought his assistance. They had mailed several letters to the renowned researcher at the Salk Institute in La Jolla, California, but hadn’t yet received a reply. As I wrote in the book, “While I was attending a professional meeting in nearby San Diego, I decided to attempt a different strategy. Although I understood that directly telephoning his office to ask for an appointment was a bit forward, it also seemed worth the risk—I couldn’t fail to reach Dr. Salk any more completely than my colleagues already had, after all. And because I refused to assume that I couldn’t make an appointment with Jonas Salk by phone, I tried—and succeeded. Dr. Salk’s assistant kindly listened to my request, then scheduled my appointment. A few days later, Dr. Salk graciously met with me for more than an hour. “At one point during our time together, Dr. Salk suddenly and without a word of explanation left the room. Was the meeting over? Should I leave? I wondered. But I opted instead to make no assumptions about what his disappearance meant and simply waited to see what would happen next. After several minutes, he returned with a number of documents cradled in his arm, publications authored by him that he hoped would assist and encourage us in our research program. From a branding perspective, how should scientists navigate their careers to assume different functions such as: manage a large laboratory, become a corporate executive, or independent consultant? Scientist can assume many functions during the course of their careers. Each new function may require learning additional skills. For example, if you are interested in pursuing management you want to be sure that this function is the right fit for you. To do that, think about the responsibilities associated with management such as interacting with a wide array of people. If management is the right fit, you should gradually build up your management experience and skills. Then, craft your resume or curriculum vitae to emphasize the function that you are pursuing. Be sure to create a distinct, intriguing, and recognizable brand to highlight that function. The goal is to clearly differentiate yourself from others who are seeking the same position. Do not expect the employer to figure out your brand for you. They must visualize your brand instantly! It is up to you to set the stage for them to do that both on your resume and curriculum vitae, and at your in-person interview. I think that it is important to understand how my branding package evolved. I own a retained executive search firm. I present one Right Fit candidate to my client-employer and close the search. This has worked well. Notably, using my Right Fit Method I made forty placements with Tom Lombardo, the Founding Editor-in-Chief of WebMD. Lombardo wrote the foreword to my book, WIN Without Competing!, explaining the impact of my Right Fit Method on WebMD. After my book was published, I received many requests, including those from scientists, asking me to mentor them on how to master my Right Fit Method. Recognizing what employers look for from a branding perspective, I developed my signature branding package which I create in concert with my executive clients. Concentrating on figuring out what your next career step should be, before discussing your brand. Creating a written brand and developing key points to articulate your brand during interviews. Crafting your resume or curriculum vitae or both to support your brand. Capturing the employer’s attention to focus on your brand, using my unique strategies to overcome distractions and objections. Convincing the employer to hire you on the first in-person interview. You can use the branding package for many purposes including presenting yourself for a position at your current institution or to a new employer, as well as for other career advancement goals. To enhance my branding program, I developed resources for my clients, which include my book, radio show and newsletter. Branding is a lifelong process, which should be incorporated throughout your career. You can even turn a wrong fit career situation into a right fit, or prevent a wrong fit if you know how to manage your brand. Many mentees say that my mentoring has transformed them. Yes, they are different. I showed them how to change, but they changed their own behavior and achieved the career success that I knew that they could, either in industry or academia. You can, too! To contact Barro, email DrBarro@WinWithoutCompeting.com or call (310) 443-4277. Her company is on the Westside of Los Angeles adjoining UCLA. The new book Marketing for Scientists belongs, not on every scientist’s bookshelf, but on their desk! It’s a useful, savvy guide for scientists on how to market their work and themselves, to the benefit of their career, their field, and science in general. 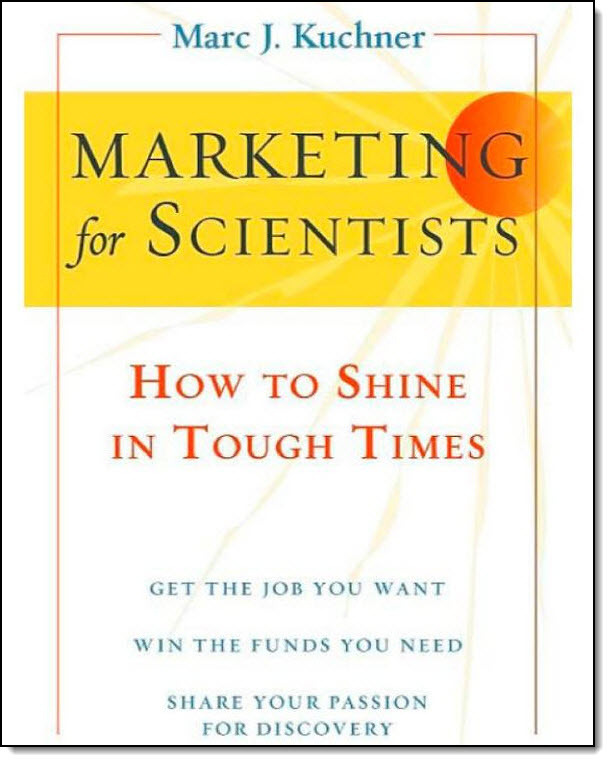 As author Marc Kuchner points out, scientists certainly need to learn marketing, given the uphill battle they face in publishing papers, winning grants, and getting jobs. And society needs scientists to market science, given such adversaries as climate change and evolution deniers, and those who cling to the dangerous myth that vaccines cause autism. Marketing is the craft of seeing things from other people’s perspectives, understanding their wants and needs, and finding ways to meet them. For example, he points out that the very basic concept of giving good customer service is an invaluable marketing tool. This service can be as basic as answering emails and phone calls promptly, and arriving at meetings on time. He also offers sound advice on “branding”—another word that might give scientists pause. But he uses the modern definition of branding as “the set of all expectations consumers have about a company or product.” And his strategies aim at helping scientists build their brand; achieving a reputation for creativity and quality. What scientist could possibly object to that! In his book, Kuchner parses “customers” whom scientists are trying to reach—e.g. students, junior scientists, senior scientists, funding agency staff, and press officers—and details their concerns and how to meet them. Kuchner also offers practical marketing techniques for getting job offers, writing proposals, producing papers, benefiting from conferences, giving talks, and using email and the internet effectively. And again, these techniques are based on communication skills, not on the old concept of marketing as crass salesmanship. He also offers excellent insight into communicating science to the public and to legislators, and to marketing science itself to a public that all-too-often harbors wrongheaded myths about science and scientists. When you communicate with people, use their names. Carry a prop; tell a story. Creating new research questions is as good for your career as answering old ones. Promote your Signature Research Idea and it will promote you; promote the idea, not yourself. Focus your research; become the go-to person in your subfield. Make videos about your work and put them online.